Bad Shibe is a sci-fi novella set in a future society that may or may not be based on a descendant of the Dogecoin cryptocurrency, where it’s as hot and as dusty as a virtual money mining rig. A trusting young shibe called YS questions the basis of their utopia and their place within it and feels … bad. The story invites us to imagine what kind of society emerges when a system designed to verify the transfer of digital assets is combined with a world where reputation is based on “followers” and “likes”. The story deals with the implications of a new wave of fully financialised planetary-scale automation and the struggle to discern right from wrong when human and machine agency merges. Bad Shibe served as a prequel to the Artists Re:Thinking the Blockchain book. Lina Theodorou’s illustrations were reproduced as large-scale wall prints, alongside print copies of Bad Shibe, in the exhibition New World Order at Furtherfield Gallery 19 May – 25 June 2017. 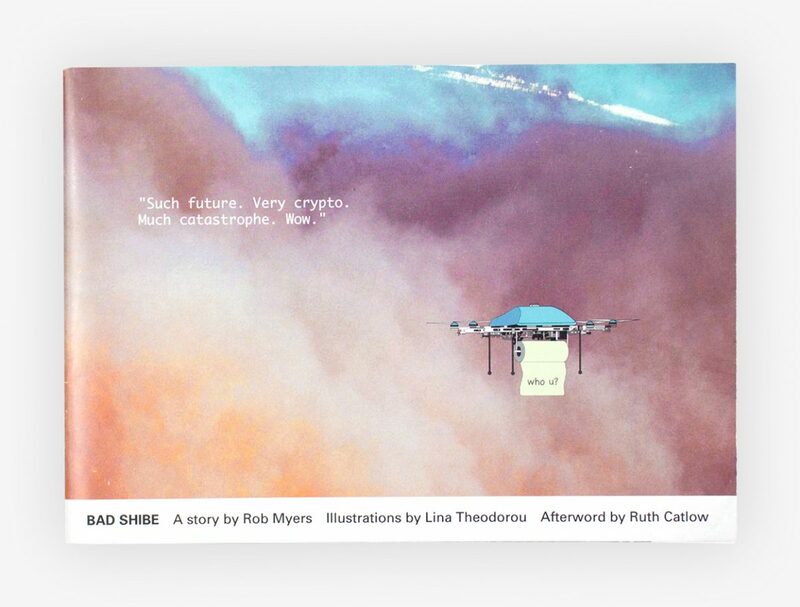 Rob Myers is an artist, hacker, and writer. For more than two decades his work has probed and clarified the significance to society of practices in expressive and engineering cultures, from the apparently mundane and bureaucratic to the deeply mysterious. Through his artworks, many of which take the form of software, he plays with concepts of art, value, authorship and creation in the age of digital networks. Lina Theodorou lives and works in Berlin and Athens, primarily through video and installations. She has participated in shows at Bozar, center for fine arts, Brussels, Museumsquartier, Vienna,National museum of contemporary art, Athens, EMAF, European media art festival, Osnabrueck, Deste Foundation, Athens, Neue Galerie am Landesmuseum Joanneum, Graz, Museum Fridericianum, Kassel,Macedonian Museum Of Contemporary Art, Thessaloniki, 8th international Istanbul Biennial, 6th ev+a Limerick Biennial, 53rd International Short Film Festival Oberhausen, 11th International Architecture Exhibition Venice Biennial, Impakt festival, Utrecht, State Museum Of Contemporary Art, Thessaloniki, Benaki Museum, Athens, Alexander S. Onassis Foundation Cultural Center, Museum of Rome in Travestere, Rome, Biennial of the moving image, Buenos Aires. Ruth Catlow is an artist and co-founder/co-director of Furtherfield. Furtherfield is an international hub dedicated to new forms of cooperation in arts, technology and society. Furtherfield’s Art Data Money programme which seeks out alternative economies to build a commons for the arts in the network age.